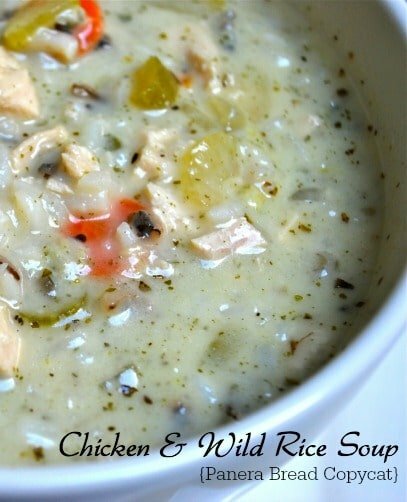 Make one of your favorite restaurant soups at home any day of the week with this version of Chicken & Wild Rice Soup; a Panera Bread Copycat. It started out one day the week before last when I told my daughter that I was going to make soup and grilled cheese sandwiches for dinner that night. When she asked what kind of soup, I had told her I wasn’t exactly sure yet but was leaning towards Creamy Tomato and Basil (which I still have to make one of these days!). She asked me if I could make Panera’s version of their Cream of Chicken and Wild Rice (her other favorite besides their NE Clam Chowder). I said I would look online to see what I could find. I found a few recipe variations and decided to use that as a base; then added some of my own ingredients to come up with my own version. 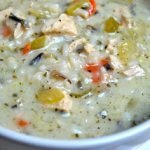 My family loved this Chicken and Wild Rice Soup and we found it to taste just like the restaurant’s version. I’ve made this soup numerous times. It’s perfect for lunch or dinner because it’s so filling. ~Enjoy! In a large saucepan, drizzle olive oil on the bottom and add your carrots, celery, onion, marjoram and seasoned flavor packet and saute for 5 minutes. Add the rice and stir; then add the flour. Next, add the chicken broth and water, bring to a boil and simmer for 15 minutes. While this is simmering, heat the heavy cream and milk in a small saucepan until hot; then add to the soup mixture along with the cooked chicken. Simmer for another 30 minutes or until the rice is cooked through. Season with salt and pepper. And now you can’t have soup without bread! My family just loves the Olive Garden Breadsticks (along with that delicious salad!). So when Joan, from Chocolate, Chocolate and More, posted this recipe I knew I had to make it~especially when my daughter saw it come off the printer! I used Joan’s recipe as she described, except for the fact that I poured all of my ingredients into my food processor (minus the warm water), pulsed it, then very SLOWLY, added the warm water until it formed a ball. Then pulsed it for another 30 seconds until well mixed, removed the dough and put it in a bowl covered with a clean towel. 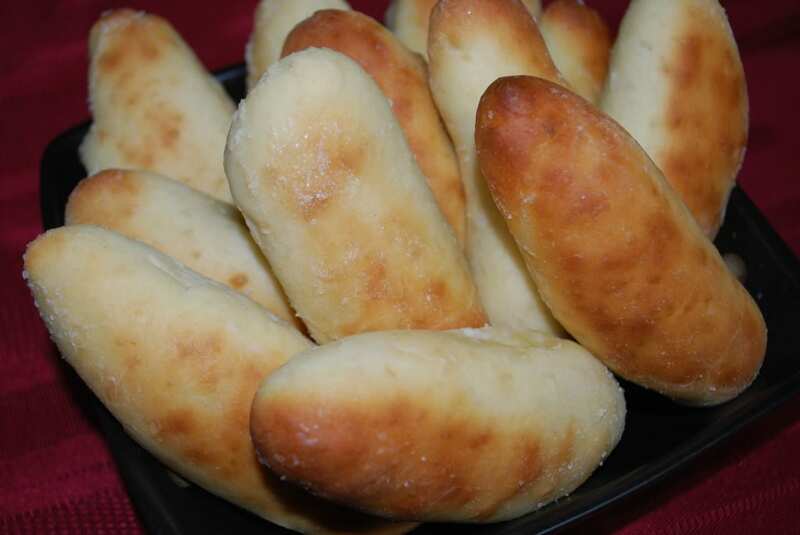 I also made them a little smaller so I got about 2 dozen breadsticks out of this recipe. The best part about this meal was that when our power went out the next night, I threw the soup in an old pot and heated it up over the fire in our fireplace…Laura Ingalls I’m not but you have to improvise when needed! Carrie, that soup looks so steamy good! Can’t wait to try it with the bread sticks! This is one of my favorite soups at Panera! Yours looks even more delicious! Enjoy it Fran, it’s REALLY good!! Found this recipe on Pinterest; possibly my favorite I’ve tried off there and I’ve tried a LOT! This is delicious! I make a double batch because I ate it too fast the first time!! 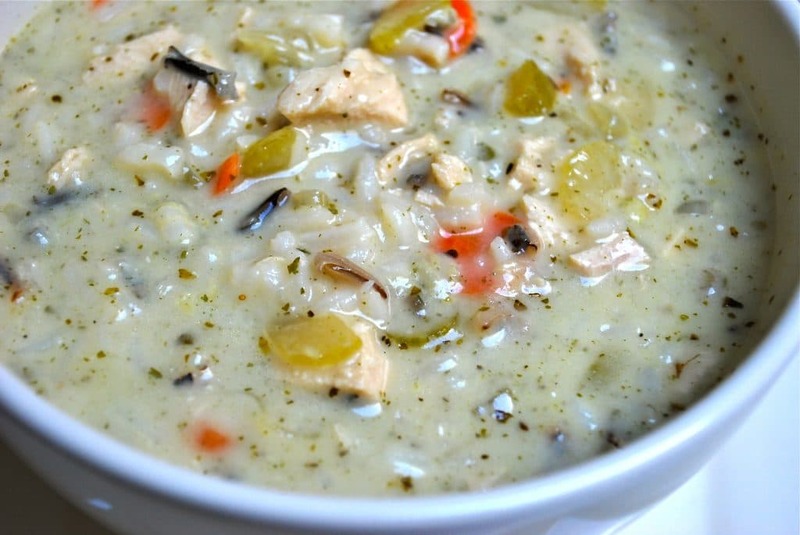 That my kids favorite soup- I will definitely make this! Thank you. My kids can’t get enough of it either, especially this time of year~Enjoy! Thank you for this recipe! We love it. I even made it for my in laws and that’s saying something! Made this last night…with the help of my food processor to slice the celery, onion and carrot and it was a crowd pleaser! It’ll definitely make again. Thanks for the recipe! Where can I find that rice mix? I’ve never seen it here. This soup sounds & looks ‘delicioso’! Thanks for this lovely recipe. Thats what great about having a freezer full of different soups…When winter sets in and you’ve lost power just “do as you did, but I’ve used our “outside gas grill” to heat up the “thrawed” frozen soup”, since not all of us have a fireplace. If you have a “Dollar Tree store”(everything is one dollar) they have THE BEST Gnocchies (from Italy) for “only one dollar!” I’m Italian, make gnocchi from scratch”, but THESE are the BEST you’ll fine.Each packet is just over a pound”.And they “cook up faster” than the frozen ones, and “not so big!”.Located in their food isle where the canned spagehhi sauce is at, usually on a lower shelf. I “stock up” at that price, as they’ll stay fresh FOREVER!…So good with your homemade pasta(or favorite jarred sauce, sprinkled with grated parmesian. Being from “Italy”for Gnocchji or polenta(coare cormel that is “spread “on a large platter, topped with a pork based pasta sauce”.You serve it “with the chunks of pork and Italian sausage pieces(from a link) around the platter.Topped with freshly grated Parmesian cheese(or jarred)…Always use “Country ribs and Italian Sausage(links)” in your sauce making…NOT ground beef. The flavor is TOO DIE FOR, and it makes a more slippery sauce”, (doesn’t “soak into” the potato gnocchi or cormeal(polenta) Make sure to sprinkle with “crushed red pepper flakes” lighlt.After making sauce with pork”, pasta sauce with “just beef” “tases so plain”…So now I’ll always “add a chunk of pork(not lean) to any homemade pasta sauce…ENJOY!